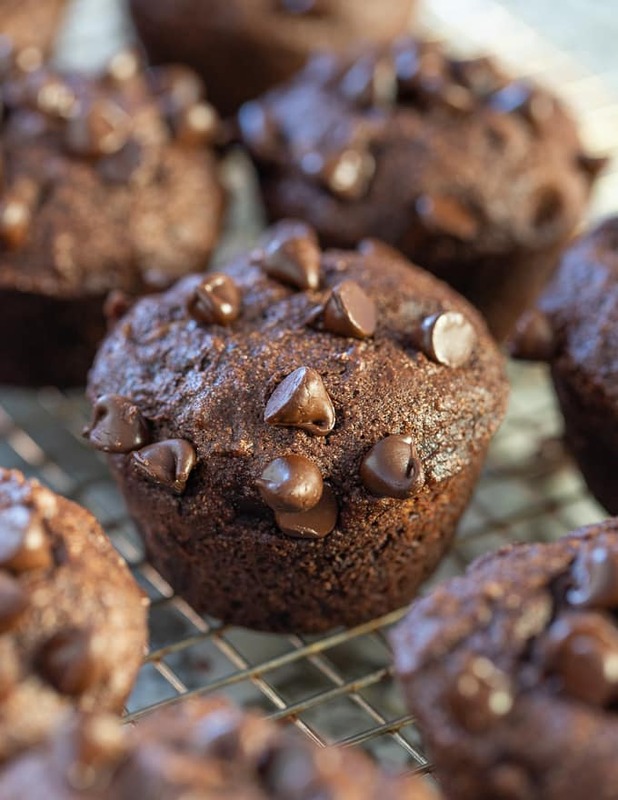 Super satisfying, insanely delicious, Healthy Chocolate Banana Muffins. Fluffy, perfectly sweet and moist, not dry and no mixer required! Vegan Chocolate Banana Bread? I see you. And I adapted your very popular self into muffin form. Healthy muffin form that is. 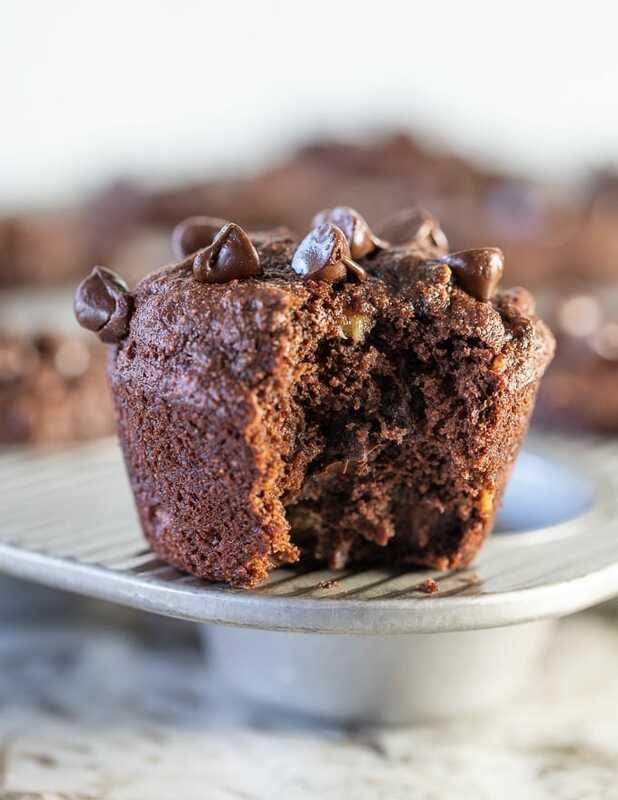 “Healthy muffins” might sound like an oxymoron (ah..I love that word) but in the case of these Healthy Chocolate Banana Muffins it’s very true and if you’ve tried my afore mentioned Chocolate Banana Bread you will know exactly what I mean. I’m still on the kind of healthy train, shall we say 80% of the time? 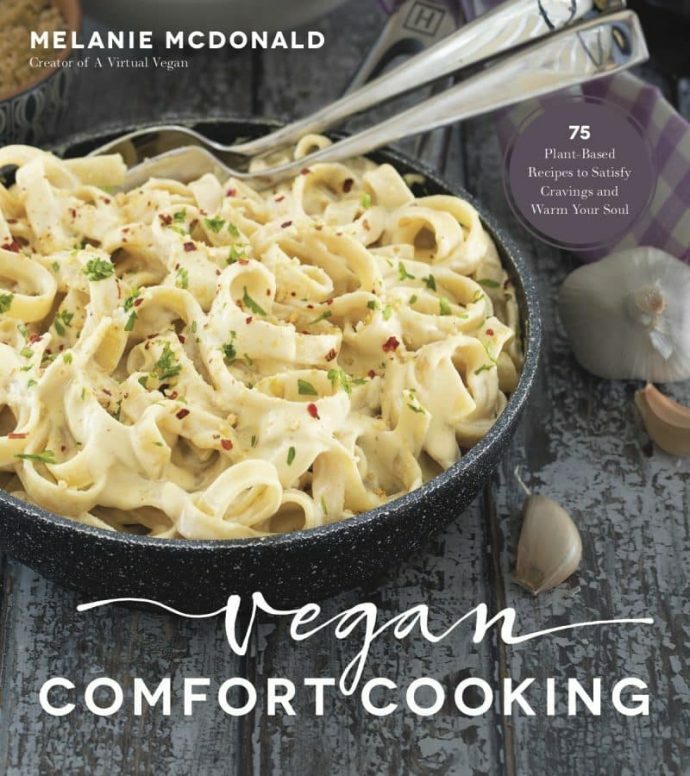 I think thats about accurate, and healthy for me, needs to be “comfort food healthy”. A pre-requisite of my life is that I have to enjoy my food. If I don’t then I am not good company. Some personal stuff that’s been going on of late, has me thinking that life’s far too short to not be enjoying every single little thing, and that includes food. And it is perfectly possible to eat crazy good food while still also nourishing our bodies. These muffins are nutritious – Made with wholegrain flour, fruit, nut butter (or sunflower seed butter if you don’t do nuts), unrefined sugar if you so wish, or whatever other kind you have in your pantry (as well as being nutritious these muffins are very forgiving), and they are not made with oil or vegan butter, and obvi no eggs or dairy because they are vegan. 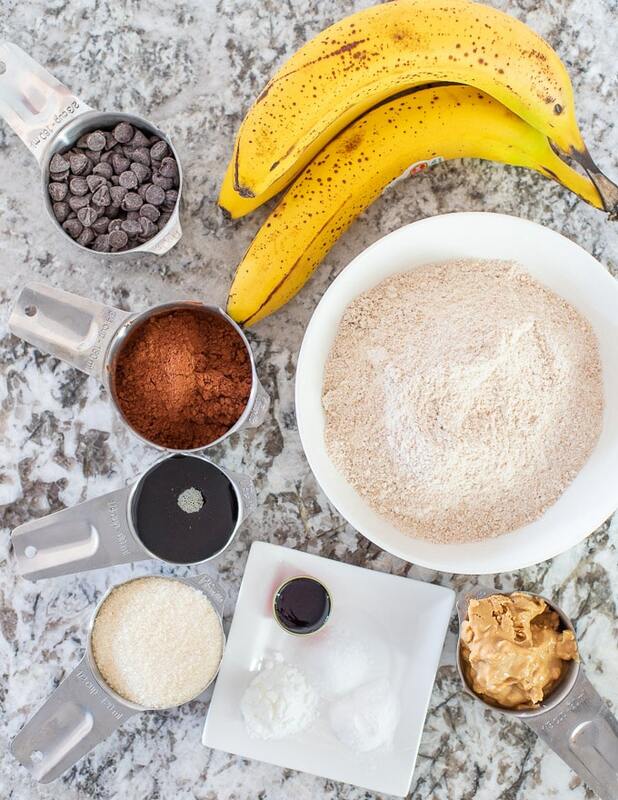 They are super easy to make – The hardest part of making them is mashing the banana. No special equipment is needed, unless you class a fork as special that is. They can be mixed up and in the oven within 10 minutes. 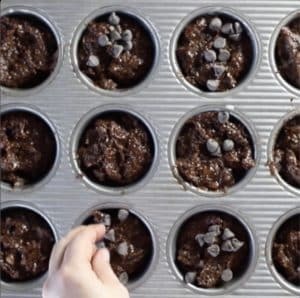 Perfect for when you are having a need muffins & need chocolate kind of moment. 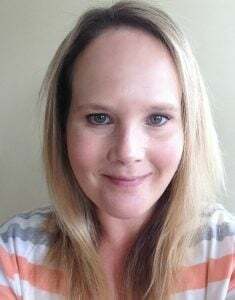 They don’t taste healthy – My kind of healthy food! They taste like fluffy, slightly fudgy, banana bread-y chocolate muffins. That is all. There are no healthy undertones. If you’re going to the trouble of making and eating a chocolate banana muffin it needs to taste good. Mission accomplished. You can have the best of both worlds. Healthy. Muffins. With chocolate. Because we all deserve a treat! So, to be clear, my message is, you know those times when you really want to bake? Because it’s fun and all that. But you don’t want to have to eat super-not healthy cake for days after? 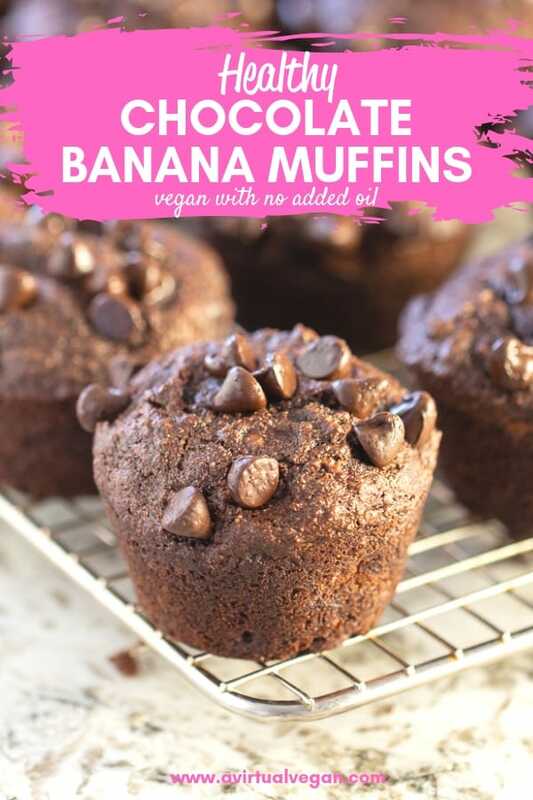 Well Healthy Chocolate Banana Muffins are your solution. In fact, they are healthy enough for breakfast, second breakfast (am I the only greedy being who has a second breakfast? – please tell me I’m not), packed lunches, afternoon snacks, dessert, supper, or just anytime you need a chocolate-y comfort food hit. 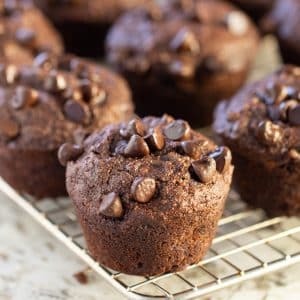 WHAT DO I NEED TO MAKE HEALTHY CHOCOLATE BANANA MUFFINS? These muffins need absolutely no special equipment. No mixer or blender. Just a bowl, a fork and a spatula or spoon. A balloon whisk is nice but not essential. And you will also need a 12 well muffin pan, or 2 6 well muffin pans. I had always used muffin liners until I got it, and I haven’t had to use liners since which is a great way to cut down on unnecessary waste. I grease the wells lightly, just in case, and the muffins pop right out. It bakes so evenly too. I absolutely love it. It has a tare function which is really handy. This means you can place any bowl on the scale and reset to zero so it doesn’t include the weight in it’s calculation, plus you can reset to zero when adding multiple ingredients to the same bowl which saves on washing up. If you do a lot of baking and want optimum results a scale really is a great investment. 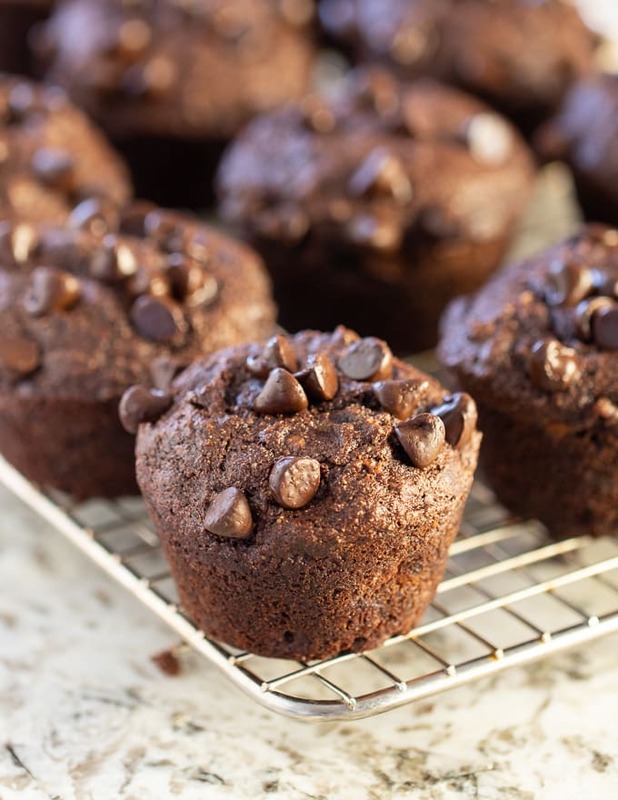 These Healthy Chocolate Banana Muffins are really quick and easy to make. 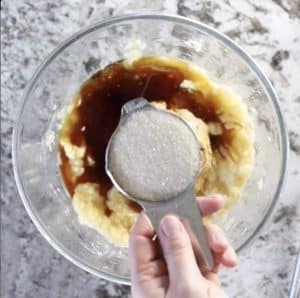 Mash the bananas up with a fork, then add some nut butter (or sunflower seed butter), maple syrup, vanilla extract, sugar and salt. Whisk or stir it all up until well combined. 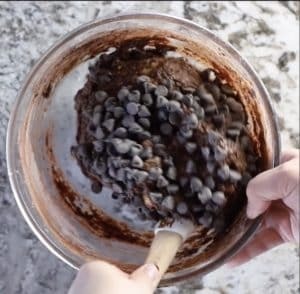 Add the flour, baking powder, baking soda, cocoa and chocolate chips and stir well. 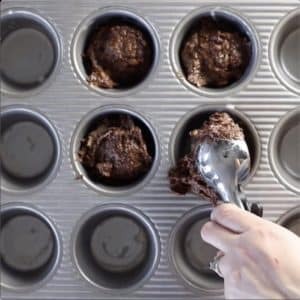 Dollop evenly into a greased or lined muffin pan, sprinkle with some more chocolate chips for good measure, and bake! 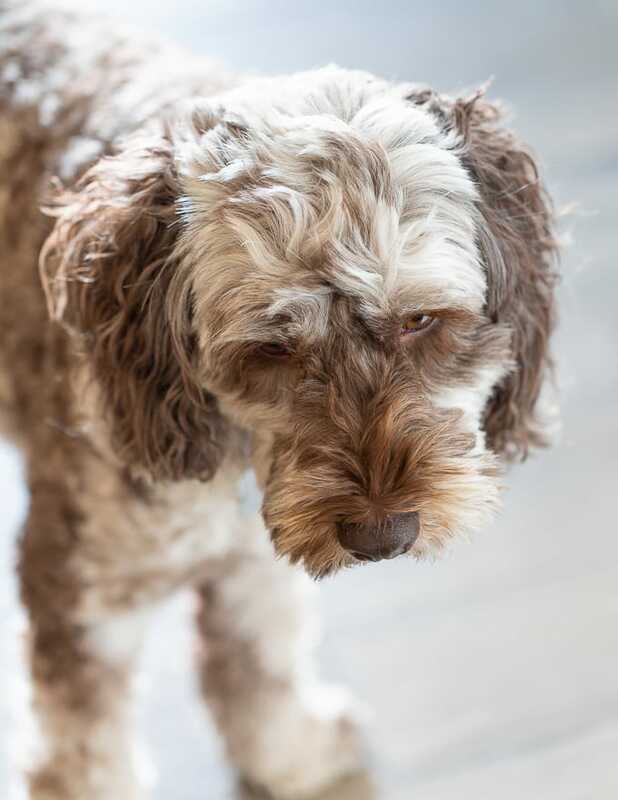 And here’s Chester staring at the spot on the floor below the muffins, waiting and wishing for me to drop every single one of them on the floor…. MY TRICK FOR PERFECTLY FORMED MUFFIN TOPS? Ever bought a muffin in a bakery and admired it’s beautiful perfectly formed muffin top because yours always turn out flat and not well risen? Then tried to recreate the effect yourself at home and ended up with overflowing muffin batter in the bottom of the oven and 399 swear words? The trick to a perfectly domed muffin top is oven temperature. They need an initial, very hot blast, which creates steam that will raise those muffin tops right up from the inside out. Then you need to turn them down after 5 minutes, so that the insides cook through more gently. 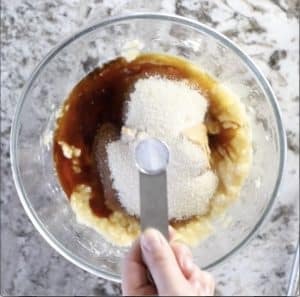 I have always advised to do this in my muffin recipes, but I’ve been told by a few readers that they have ignored me because they thought it was a waste of time and too much faff. Well, I’m here to tell you that the faff is worth it. It really does make a difference. Not only do they end up taller, they end up fluffier and lighter too because of that extra puffing action. Um, chocolate cake for breakfast! Super easy to make with no special equipment. Perfect for breakfast, lunch boxes, snacks or dessert. Your day just got a whole lot tastier! 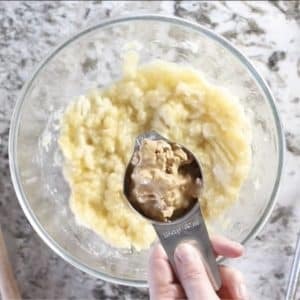 6 tablespoons cashew butter , or any other nut butter. Use sunflower seed butter if you want to keep the muffins nut-free. ½ cup / 100 g sugar of choice , any works here, white, brown, cane, turbinado, coconut..just use whatever you have. Preheat the oven to 425°F (218 °C) and grease or line a 12 well or 2 x 6 well muffin pans. 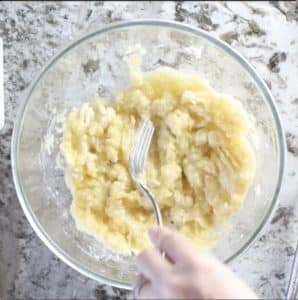 Mash the bananas really well with a fork or potato masher until they are a slightly lumpy puree. 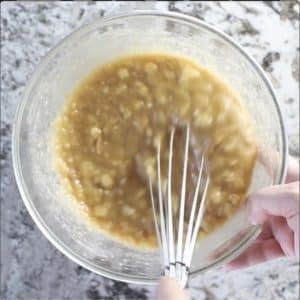 Add the cashew (or other nut/seed) butter, maple syrup, vanilla extract, sugar and salt to the bananas and whisk together until really well combined. 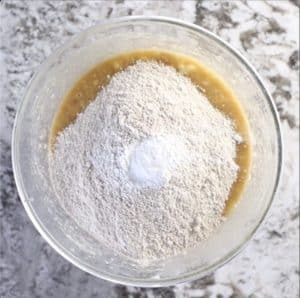 Add the flour, baking powder, baking soda and cocoa powder and fold it in gently BY HAND (not with a mixer, food processor or blender) until everything is just combined. 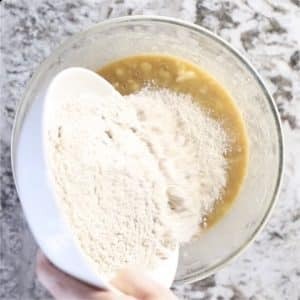 Do not over mix because it will affect the texture and rise of the muffins. Finally add the chocolate chips and fold them in just enough to distribute evenly. 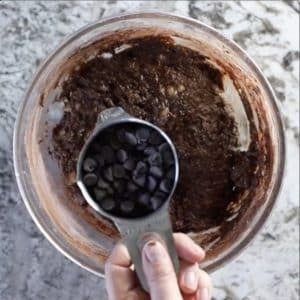 Spoon the batter evenly into the prepared muffin pan and sprinkle the tops of each with a few more chocolate chips. Place them in the oven and set a timer for 5 minutes. 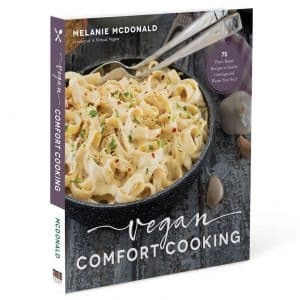 Once the 5 minutes has passed, immediately turn the oven down to 375°F (190°C) without peeking or opening the door and cook for a further 13 - 14 minutes. Check them with a toothpick and if it comes out mostly clean then they are done. It is important not to over-bake these muffins. If anything they are better very slightly underdone to keep their moist fudginess. Cashew butter has the most neutral flavour so is my nut butter of choice but any nut or seed butter will work. Be sure to use good quality nut butter without additives. I always make sure to buy brands with nuts or nuts and salt as the ingredients and have not tested this recipe with the more processed kinds with added sugar and artificial ingredients. 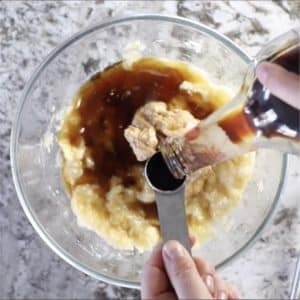 Do not skip the maple syrup or replace it with sugar. The maple syrup is what keeps these muffins moist and fudgy. I have not tested this cake with any other flours except spelt or all purpose. If you use another kind you do so at your own risk. I can't recommend spelt flour enough though for muffins or cakes like this. It gives excellent results. Much lighter and fluffier than all purpose flour or wholewheat. Store the muffins in a sealed container. They will keep for 4 - 5 days. They also freeze very well.